The plot follows 8-year-old Lily Polkadot who just moved to the “Squares Only” small town of Rockaway. As the first Polkadot in an all Square school, Lily faces an almost impossible task of gaining acceptance from her peers. From daily bullying to segregated drinking fountains, Lily’s quest seems hopeless until she meets Sky, a shy Square boy whose curiosity for her unique polkadot skin blooms into an unexpected pal-ship. 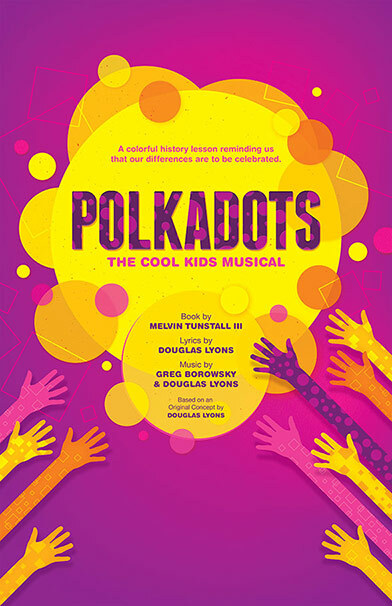 Inspired by the events of The Little Rock 9, Polkadots serves as a colorful history lesson for children, reminding them that our individual differences make us awesome, not outcasts. Doubles as both characters: Mrs. Square is the teacher at Rockaway Elementary responsible for integrating Polkadots and Squares; she’s the disciplinarian- conflicted yet gentle and loving all in the same. Mama Square is a loud mouth, overbearing and stuck in her ways. Lily is the sunlight in the midst of a storm; smart, charming and strong willed; she has the task of being the first of her kind ever integrated into a school of all Squares. A straight up bully; bratty, loud and entitled; the world revolves around Penelope and we just happen to be living in it; older sister to Sky Square. Ideally short; video games illuminate his imagination; he’s anxiously shy, friendly, quirky and curious; younger brother to Penelope Square and admirer of Lily Polkadot.